е серамен евклид во сесјајната улица. и бранчињата сладост од автоматите. ist ein immer flacher Euklid in der immer strahlenden Straße. und den Wellchen Süße aus den Automaten. Vera Čejkovska, born in 1954, Skopje, Republic of Macedonia. Poet and essayist who wrote in Macedonian language. She received her B. Sc. (physics) from the Sts Cyril and Methodius University in Skopje in 1979, her M. Sc. from the University of Zagreb, Republic of Croatia, in 1990, and her D. Sc. from the Sts Cyril and Methodius University in Skopje in 2005. She worked as a lecturer at the Sts Cyril and Methodius University, Skopje, Faculty of Natural Sciences and Mathematics, Seismological Observatory. Her poems have been translated into fifteen other languages and included in anthologies and selections of Macedonian poetry, published in the Republic of Macedonia and abroad. She has received the award 'Mlada Struga' (1976) for young Macedonian poets; the 'Koco Racin' award (1992) for the book 'Opit' and 'Aco Sopov' award (2007) for the book 'Rabovi'. A considerable number of Macedonian critics issued more than thirty reviews on her poetry, appraising it from its very beginnings as 'radically innovative in relation to the rest of the Macedonian poetry' and denoting it as 'quantum poetry', 'noetics-and-poetics', 'holographic poetry' or 'poetics of the riddle' (G. Stardelov), 'a new sensibility' (M. Gjurcinov, M. Matevski), 'poetics of restructuring' (K. Kjulavkova). 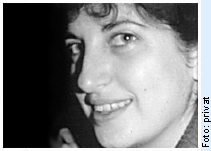 She was a member of the Macedonian Writers’ Association, Macedonian P.E.N. Centre, Society of Physicists of the Republic of Macedonia, Macedonian Association of Engineers in Physics and Macedonian Seismologists’ Association. She was editor of the magazine Stozer and editor-in-chief of The Macedonian P.E.N. Review.